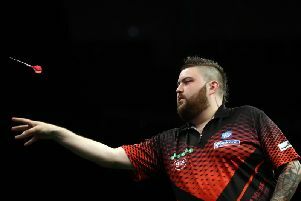 The look of sheer frustration on Michael Smith's face told its own story as his hopes of reaching the second stage of the Unibet Premier League were dealt a blow in Germany last night (Thursday). Smith - last year's runner-up - was hammered 7-2 by Austrian-based Mensur Suljovic who moved into one of the play-off spots. Bully Boy, on the other hand, is seemingly locked in a battle of survival with five-times world champion Raymond van Barneveld who currently props up the table om four points - one less than Smith. 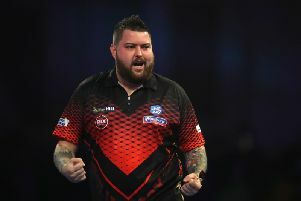 The St Helens arrow smith faces Welshman Gerwyn Price next Wednesday and the following night takes on James Wade, while Barney locks horns with Ireland's Daryl Gurney and fellow country man Michael van Gerwen respectively. Significantly, both set of fixtures will be staged in Rotterdam and Van Barneveld will be playing in front of his home crowd which will arguably give him a slight psychological advantage. But Smith will have to play much better than he did in losing to Suljovic if he is to progress and at this moment in time it balances delicately on a knife edge.